CryptoWall’s encrypter is back in CryptoWall 5.1 variant and it is used in a ransomware virus which pretends to be Cryptolocker. The virus uses the .locked file extension which it ads after encrypting the files of the infected computer with an immensely strong AES-256 encryption algorithm and asks from users to pay 250 Euros to get them back. CryptoWall has been through many changes and many consider it to be the virus causing most damage in comparison to all ransomware viruses. If its encryptor is back this is a strong indicator that the CryptoWall gang may be back in business. Everyone who has been infected by CryptoWall 5.1 should immediately take actions for removing the virus and trying to restore the .locked files using alternative solutions to gain back access to their files like the ones in this article. Short Description CryptoWall 5.1 encrypts files with a strong AES-256 cipher asking 250 Euros for decryption. Symptoms Files are encrypted with the .locked file extension and become inaccessible. A ransom note with instructions for paying the ransom may shows on the screen. User Experience Join our forum to Discuss CryptoWall 5.1 Ransomware. The cyber-criminal gang behind CryptoWall 5.1 may use different spam techniques with the one and only purpose of tricking users to into opening its malicious URLs or executables containing its payload. There is also the chance that the user is being redirected via a malicious URL, which is posted in e-mail bodies, on social media and other communication platforms. Ad-supported PUPs(Potentially Unwanted Programs) may also cause direct browser redirects which may infect the user’s computer and cause immense damage not only by CryptoWall 5.1 but other malware as well. 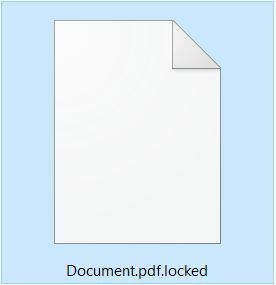 After encryption, the files cannot be opened with any program. The only 100 percent working direct solution appears to be either paying the cyber-criminals for a unique decryption technique like purchasing a key and a decryptor made by them. Cryptolocker è un malware appartenente alla famiglia dei ransomware. Questo virus è in grado di criptare con algoritmi asimmetrici i file della vittima. Come faccio a ripristinare i miei documenti? I tuoi documenti, foto, dati e altri file importanti (compresi usb, hard disk, percorsi di rete etc. ) sono stati criptati con un algoritmo asimmetrico a due chiavi, pubblica e privata. Tutti i file sopra citati che hanno l’estensione .locked sono stati bloccati, per sbloccarli hai bisogno della chiave privata. Come ottengo la chiave privata? Mentre la chiave pubblica и stata salvata in una directory di sistema del tuo computer, quella privata и stata inviata sul nostro server, per ottenerla devi pagare la cifra di 250 €. In caso contrario al termine delle 48h previste per il pagamento del riscatto la chiave privata verrà eliminata e non sarà più possibile recuperare i file. ATTENZIONE: La rimozione di Cryptolocker non ripristina l’accesso ai file cittografati. The virus saves a public key on the user’s computer, most likely in a .KEY file and the private key it may send to the malicious server of the cyber-criminals behind CryptoWall 5.1. To gain access, it gives a deadline of 48 hours after which the cyber-criminals threaten to delete the private key. Malware analysts recommend not to pay any ransom to cyber-crooks because you support their cyber-criminal organization and malicious activities. In addition to that, it is no guarantee that these cyber-terrorists will give access to your files. However, you may want to contact the e-mail address [email protected] sigaint.org to ask for the free decryption of one file which you may later use to attempt and factorize other keys which may decrypt the rest of the data. We have provided in step “3. Restore files encrypted by CryptoWall 5.1” alternative methods and decryptors which may assist you in the decryption process of the file encoded by CryptoWall 5.1. But before attempting any decryption, backups or file restoration methods, we strongly advise you to remove it using an advanced anti-malware program. You can follow the tutorial below, since it is designed for maximum effectiveness and remove the virus automatically and swiftly. This will help detect all of its files, instead of costing you time to find them manually and increasing the risk of you losing your files. Furthermore, it is recommended to have an advanced anti-malware software since it also features a real-time shield protecting you from devastating threats like CryptoWall 5.1 in the future as well. Researchers also believe that this ransomware has been created based on the HiddenTear open source project which has been the root cause for other ransomware viruses, like Strictor and Sanction ransomwares. Decryptor is expected to be released eventually and we urge you to keep an eye on this article and we will update it as soon as this is done. In the meantime you may try the methods in this article to attempt file restoration. Threats such as CryptoWall 5.1 may be persistent. They tend to re-appear if not fully deleted. A malware removal tool like Combo Cleaner will help you to remove malicious programs, saving you the time and the struggle of tracking down numerous malicious files. Threats such as CryptoWall 5.1 may be persistent on your system. They tend to re-appear if not fully deleted. A malware removal tool like SpyHunter will help you to remove malicious programs, saving you the time and the struggle of tracking down numerous malicious files. Note! Your computer system may be affected by CryptoWall 5.1 and other threats. SpyHunter is a powerful malware removal tool designed to help users with in-depth system security analysis, detection and removal of threats such as CryptoWall 5.1. 1. Install SpyHunter to scan for CryptoWall 5.1 and remove them. 2. Scan with SpyHunter, Detect and Remove CryptoWall 5.1. Ransomware infections and CryptoWall 5.1 aim to encrypt your files using an encryption algorithm which may be very difficult to decrypt. This is why we have suggested several alternative methods that may help you go around direct decryption and try to restore your files. Bear in mind that these methods may not be 100% effective but may also help you a little or a lot in different situations. Note! Your computer system may be affected by CryptoWall 5.1 or other threats. Remove CryptoWall 5.1 by cleaning your Browser and Registry. Fix registry entries created by CryptoWall 5.1 on your PC. Combo Cleaner is a powerful malware removal tool designed to help users with in-depth system security analysis, detection and removal of threats such as CryptoWall 5.1. Step 5: In the Applications menu, look for any suspicious app or an app with a name, similar or identical to CryptoWall 5.1. If you find it, right-click on the app and select “Move to Trash”. Step 6: Select Accounts, after which click on the Login Items preference. Your Mac will then show you a list of items that start automatically when you log in. Look for any suspicious apps identical or similar to CryptoWall 5.1. Check the app you want to stop from running automatically and then select on the Minus (“–“) icon to hide it. Remove CryptoWall 5.1 – related extensions from your Mac’s browsers. A pop-up window will appear asking for confirmation to uninstall the extension. Select ‘Uninstall’ again, and the CryptoWall 5.1 will be removed. When you are facing problems on your Mac as a result of unwanted scripts and programs such as CryptoWall 5.1, the recommended way of eliminating the threat is by using an anti-malware program. Combo Cleaner offers advanced security features along with other modules that will improve your Mac’s security and protect it in the future. Hey !, I found this information for you: "Remove CryptoWall 5.1 Ransomware and Restore .locked Encrypted Files". Here is the website link: https://sensorstechforum.com/remove-cryptowall-5-1-ransomware-restore-locked-encrypted-files/. Thank you.